The DFW and DGT series’ indicators can be use as a weight repeaters in combination with the MSTSLV optional program, designed for using the instrument both as a UNIVERSAL weight repeater and as a MULTI-SCALE repeater (MASTER). 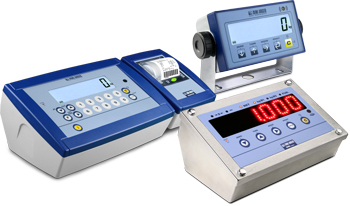 Function which allows to repeat up to 32 independent scales, with the possibility of managing their functions, or displaying and printing the sum of the weighs of all the scales, for a weighing application with crane scales, or for vehicle weighing. Function which allows to repeat the weight of any scale, through the configuration of the input string. Display of connected scales: weight and functional icons of the selected scale or weight sum. Management of the displayed scale’s functions: ZERO, TARE, PRINT, ENABLING/DISABLING of the FUNCTIONING MODE (with only 1 connected scale), SWITCH-OFF and KEYS’ REPETITION. Printer management: printing of the weight and data configured on the displayed scale or printing of the weight of all the connected scales and of their sum. Data transmission to PC: transmission of the displayed weight (single scale or sum), continuously or by pressing a key. Analogue output management: value proportional to the weight of the displayed scale or to the weight sum. 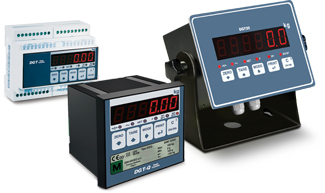 Input string configuration: in accordance with the string transmitted from the connected scale, one can configure the location and length of the weight data within the string, etc. Data transmission to PC: transmission of the weight of the connected scale, continuously or by pressing a key. Analogue output management: value proportional to the weight of the connected scale.